White-sand beaches, swaying palm trees and warm weather are among the top reasons why many honeymooners decide to get away to a tropical island. In the tropics, couples can relax in the sun, go kayaking and snorkeling, and take romantic sunset walks along the beach. There are many fabulous honeymoon ideas to choose from, including the Caribbean islands, Tahiti, Hawaii, Bora Bora and Australia. Here are some of the top tropical honeymoon ideas around the world. The architects of Ladera in St. Lucia were brilliant at incorporating the stunning views from the property into the design of the hotel. The 38 villas and suites all have open walls facing the ocean over a thousand feet below. Couples enjoy private plunge pools, privacy and accommodations constructed from tropical hardwoods, stone and tile at this romantic hotel. The interior is decorated in 19th-century French style with four poster beds and unique local art. Ti Kai Pose Spa is one of the best on the island. The "Little House of Rest" offers treatments inspired by the island's lush rainforest and volcanic history. The hot tubs in the spa gardens offer a romantic setting for couples to revitalize surrounded by nature. If you prefer, you can order a massage in the privacy of your own suite, or even book an outdoor massage with views of the beautiful pitons. In the evening, book a table at Dasheene restaurant which serves award-winning cuisine with incredible views of the island and the Caribbean Sea. The restaurant offers a sustainable Caribbean-style menu with emphasis on ingredients from local farms and plantations. If you can time your vacation so that you are at the resort for Sunday Brunch, you can dine to the beat of live music by St. Lucian Shak-Shak band. You may decide that a private plunge pool, massages and romantic dinners are all that you need on your honeymoon. But if you are looking for adventure, the destination offers many activities, including hiking, glass bottom boat tours, Gros Piton climbing, botanical garden tours, romantic sunset sails, zipline adventures, sailing, snorkeling, diving and more. 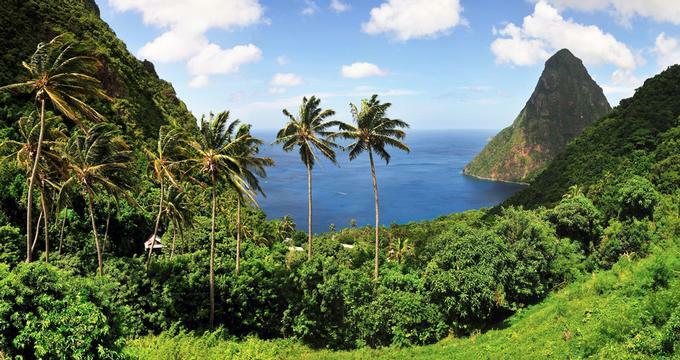 St. Lucia is one of the best tropical honeymoon destinations in the world. Suites with plunge pools start at $450 per night. 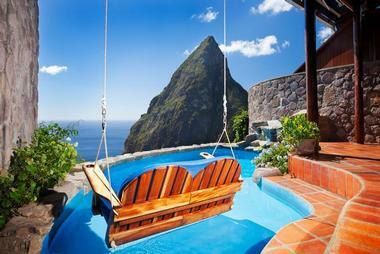 More about Ladera and honeymoon ideas. Lush tropical grounds, hip decor and attentive service make the Golden Rock Inn in Nevis the perfect escape for couples looking for a quiet honeymoon experience. The inn is set on an old sugar plantation, complete with a restored country house and mill. 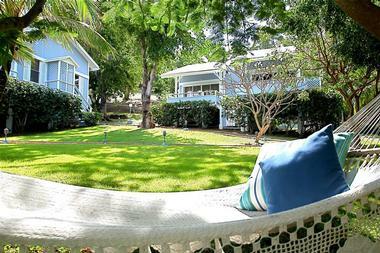 Ask for one of the tranquil cottages with terraces and lush green surroundings. The property is owned by New York artists Brice and Helen Marden who thought of every detail to make your stay more comfortable, from beautiful ponds, outdoor pool with ocean views and a stylish restaurant designed by architect Ed Tuttle who is known for his work on the luxury Aman Resorts. 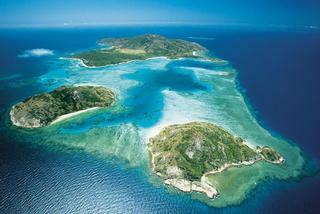 Palm Island Resort is an exclusive private island getaway with swaying palms, white sands and clear waters. Resting on the southern tip of St. Vincent and the Grenadines in the Caribbean, this exquisite retreat epitomizes barefoot luxury and island living. There are 43 guest rooms, suites and villas set right on the beach or a few steps away. Woven rattan ceilings and simple bamboo furnishings create a Crusoe-esque ambiance, while modern amenities such as air-conditioning, mini-fridges with complimentary soft drinks, and coffee makers offer five star comforts. There are activities for every taste, from lounging in beach hammocks and walking along nature trails to tennis, croquet, shuffleboard and an array of non-motorized water sports. Work out in the air-conditioned gym or have an indulgent massage in the comfort of your room. Relish international fare with Caribbean flair and spectacular ocean views at the elegant Royal Palm Restaurant or beachfront Sunset Grill. Enjoy cocktails and hors d'oeuvres in the laid-back atmosphere of one of the two Palm Island beach bars. If you are looking for the ultimate beach honeymoon destinations, this private island is a great choice. Doubles start at $845 per night. 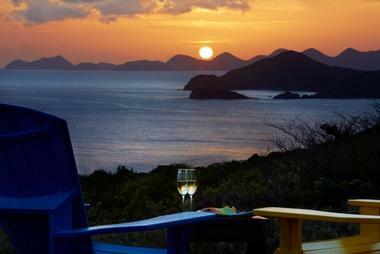 Katitche Point Greathouse in the British Virgin Islands is a luxury villa getaway with four guest suites overlooking the Caribbean Sea. Guest accommodations are furnished with rich wood tones, Puerto Rican sandstone, and ethnic artworks from the Caribbean, Africa and Asia. Choose from many different activities on the island, including snorkeling, scuba diving, deep sea fishing and hiking. Be sure to give yourself plenty of time to relax by the pool with a view. 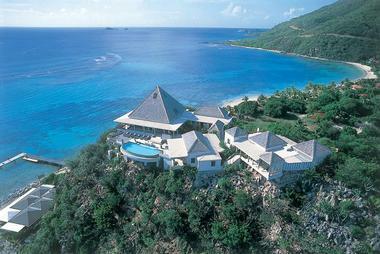 The villa is located on the west side of Virgin Gorda between Mahoe Bay and Pond Bay. The villa offers scenic ocean views over the Sir Francis Drake Channel. Suites start from $5,100 for 3 nights (+ 49 761 552930). Browse more Caribbean honeymoon ideas. If you are looking for something adventurous on your honeymoon but you still want to be able to sit in the sand when you feel like it, head to Lizard Island. The newly renovated resort offers a wide range of activities like tennis, snorkeling, glass bottom boat rides and sport fishing. However, the most impressive activity on the island is diving. Try the introduction to scuba diving course or dive the world famous Cod Hole. If you decide that scuba diving is not for you, Lizard Island's many bays are great for relaxing in the sun and taking the occasional dip in the ocean. Le Meridien Bora Bora in French Polynesia has excellent beaches, great ocean views, and romantic overwater bungalows. If your idea of romance is sunbathing and relaxing on your very own private overwater deck than consider one of the resort's premium bungalows. The premium bungalows are the most private of all the accommodations at the Le Meridien, making them the best option for a romantic getaway. Le Meridien Bora Bora is one of the best island getaways in French Polynesia. Lounge around on your deck and when you get too hot simply slip off your deck right into the water. When you are done enjoying the view from your deck, head to the spa for 3 hours of Polynesian Treasure treatment. This full body treatment includes: cleansing scrub of your choice, shower-jet, scalp and body massage with essential oils (tonic, harmony, serenity or calm), rejuvenating facial, aromatic bath and an iced tea. Anyone who has ever taken a romantic getaway to a resort knows that a romantic stroll down the sand is a must. However, the problem is that at so many resorts today you run out of beach after four or five minutes of walking. This is definitely not the case at Peter Island Resort, a private 1,800 acre island getaway located in the British Virgin Islands. On 1,800 acres with only 52 rooms the Peter Island Resort is a romantic getaway where you won't have to get up at the crack of dawn to save a spot. As a guest of the resort you can choose to enjoy the sun and sand on any one of the islands five beaches. The three accommodation options on the island are garden and ocean view rooms, beach front suites, and several different villas which range in size from three to six bedrooms. If you are looking for dream tropical vacation destinations in the Caribbean, this resort is a beautiful place to visit on your honeymoon. 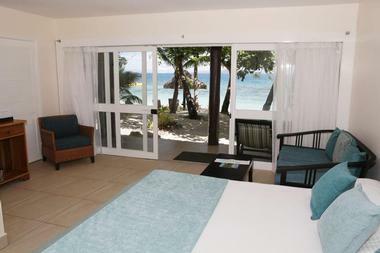 Garden and ocean view rooms start at $540 and the beach front suites start at $790 dollars in the low season. Located on a private island in the Gaafu Alifu Atoll, the Residence Maldives is a secluded hideaway with just 94 luxury villas with private pools, perfect for couples looking for luxury and privacy. 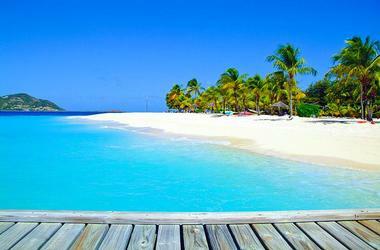 Here you will find some of the best honeymoon beaches. You'll be just a step away from a pristine sandy beach and clear blue ocean when you stay in one of thatched roof beach houses which feature lush fabrics, air-conditioning, overhead fan, 40 inch LED TV, DVD player, direct dial telephone, internet connection, personal safe, in-villa bar, hairdryer, expresso machine and tea making facilities. Water villas are a wonderful idea for a honeymoon or romantic getaway, offering 360 degree ocean views and plenty of privacy. 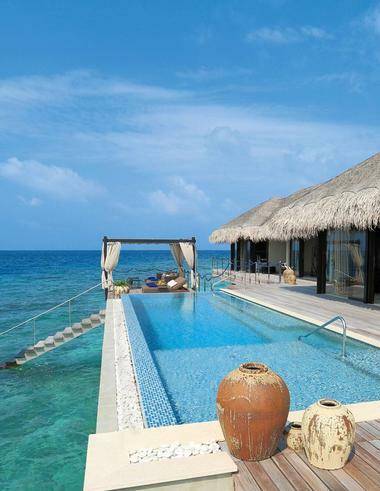 Cool off in your private overwater pool and jump into the blue lagoon to swim with tropical fish. The resort has a Kids' Club, Boutique & Gift Shop, DVD & CD Library, Fitness Center, Internet Corner, Sauna & Steam Room and a Library. The island is a getaway for water enthusiasts, offering great scuba diving, catamaran sailing, windsurfing and kayaking. The PADI 5-Star Dive Center offers beginner diving courses snf deveral spectacular dive sites are a short boat ride away. The resort offers two restaurants and a beach bar. A romantic private dinner can be set up for you on the sand and other scenic locations. VacationIdea.com Tip: If you are looking for a unique destination to tie the know, ask about the Underwater Package. 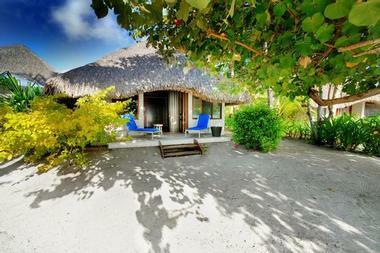 Villa rates at start at $975 USD per night. Browse details or read more honeymoon beach ideas. Nestled amidst lush tropical forests on the hills of Culebra Island in Puerto Rico, Club Seabourne is a sumptuous island hotel with luxurious villas, cottages and suites. Living spaces are light and airy with large windows embracing breath-taking views, while modern amenities, such as air-conditioning and cable television, provide creature comforts. Relax surrounded by lush gardens in a gently swaying hammock with a book or take a refreshing dip in the swimming pool. Explore the island’s white-sand beaches and shallow reefs as you snorkel, scuba-dive, kayak and fish. Book a poolside massage with a view on your honeymoon. Gio Gastro Bar serves heavenly cuisine, including freshly baked pastries on the breakfast terrace and succulent seafood feasts under the starlit sky in the evenings. Rates start at $169 per night. Anantara Bali Uluwatu Resort enjoys a spectacular cliff-side setting high above the ocean, a perfect setting for couples and honeymooners. Choose from romantic suites and luxury Bali villas with private pools with beautiful ocean views. The resort is home to the famous Anantara spa which offers a number of healing therapies. Guest accommodations are designed in modern style, with huge panoramic floor-to-ceiling glass windows which face the Indian Ocean. You can watch the waves as they roll towards the beach below on your romantic vacation. Choose from 74 seaview suites, private pool villas and duplex penthouses. Modern amenities found in all guest suites and villas include iPod docks, iPads available for use in the library, broadband internet and plasma TV with international satellite and DVD, as well as a home stereo system. If you don't want to splurge on a pool villa, you can still get access to a private pool if you check into one of the Ocean Front Pool Access Suites. These suites have access to a private oceanfront infinity pool facing the ocean. There is also an ocean-view terrace with an outdoor soaking tub. Anantara Spa has treatment rooms designed as your own private enclave, surrounded by a rainforest in a cliff-side setting. The separate Spa Villa compound includes 4 single treatment rooms, 1 couples treatment room, Reflexology room, Private en-suite steam rooms and a Private pool. Ask about spa packages at the resort - you can often save on treatments and receive extras such as airport transfers. Have a romantic sunset dinner at the Rooftop Restaurant, Bar & Lounge set high above the ocean and the Impossible Beach. Or have a quick snack at the Pool side Restaurant & Bar. 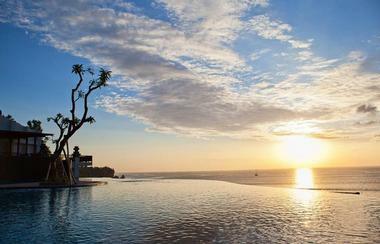 Rates at Uluwatu Resort start at $385 USD per night. 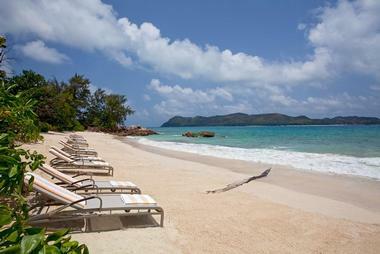 Napasai Hotel is set on Baan Tai Beach on the northern shore of Koh Samui in Thailand. This luxury resort is an ideal spot for people who love nature and the sea. Napasai is just an hour and a half from Bangkok by plane and twenty five minutes from the airport. It is located in the midst of Ang Thong Marine National Park. There are 69 different villas and residences to choose from, ranging from one room villa suites to private pool residences, equipped with modern amenities such as LCD TV and DVD player, wireless internet and air conditioning. Couples who like romantic strolls along the sandy shore should choose ocean front villas. For people who seek privacy, there are private pool residences with fully fitted kitchens, spacious living areas, and a private pool. These residences jut out of the cliff side offering a stunning view of the ocean. Packages also include personal housekeeping services. For fans of Thai cuisine, the La Tai Restaurant offers fine dining in elegant indoor and balcony settings. Internal cuisine is available at the Beach Restaurant which offers light dishes and fresh seafood barbecue. >The Lobby Bar offers anything from refreshing cocktails to fragrant teas in a relaxing and elegant setting. The Pool Bar has ocean views and serves different beverages, snacks, and light dishes. Guests choose from a wide range of treatments at the spa, or, if you prefer, in the privacy of your villa or residence. These services include packages, different types of massage, facials, heat therapies, body scrubs, body masks and wraps, all designed to enhance your relaxation. The property is is just five minutes away from the Santiburi Golf Club, one of the finest courses in Thailand, where expert lessons can be arranged and golfing equipment are available for hire. There are many family oriented activities on site, such as wide open beaches, pools, table tennis, badminton, windsurfing, and Hobie Cat. Visits to neighboring islands, scuba diving, trekking and fishing expeditions can also be arranged. Yoga and Tai-Chi sessions are also available. The staff can arrange other local tours. To make sure that children have a memorable stay, there are special children's menus at the restaurants, a dedicated children's pool, and a host of family-friendly activities to choose from. The beautiful tropical setting, clean beaches and luxurious atmosphere make the resort an ideal wedding location. Buddhist, Catholic, non-religious and vow renewal ceremonies may be accommodated at different venues. The staff is always available to help with the details. Conferences, presentations and meetings for up to 20 people can be accommodated at the Business Center. Rates at the hotel start at 9,100 THB per night. 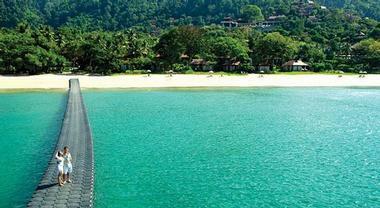 Plan a honeymoon vacation to Kewarra Beach Resort, a secluded hideaway in Queensland, near Cairns, Australia. Enjoy the privacy of your own cottage, explore the beautiful tropical gardens and lounge on the private sandy shore. 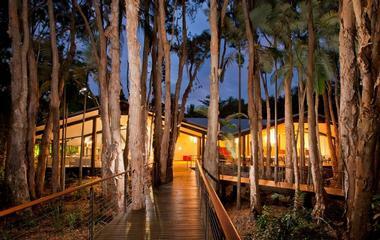 Guest cottages at Kewarra are surrounded by the gardens and a lagoon. Although all have verandahs, Bauhinia Suites are the most stunning, with a sitting area right over the water. Because of its location next to pristine rainforest parks and a boat ride away from the famous Great Barrier Reef, Kewarra Beach Resort provides a great base for exploring the area and for trying out different vacation activities. Go scuba diving on the Great Barrier Reef, tour the Australian Outback, rent a sea kayak, and enjoy a variety of watersports on your honeymoon vacation. Ask the hotel restaurant to prepare a picnic basket which you can take with you. The hotel offers several services perfect for honeymooners, including a dinner right on the water. Enjoy a romantic dinner for two surrounded by torches and the Coral Sea. The hotel can hire a violinist to play for you while you dine. Barefoot luxury takes on new meaning on the idyllic private island of Velaa in the Maldives. Bathed by azure skies and cobalt seas, this unique and secluded island getaway embodies the very best of this beautiful archipelago. Epitomizing luxurious island-style living, eight spectacular villas have been individually handcrafted to create an intimate and exclusive experience. Designed to blend seamlessly with the lush surrounding landscapes of jungle, sand and sea, sun-bleached wood, sculptured stone and delicate oceanic details echo a distinct Maldivian flavor. No less than five award-winning restaurants can be found around the island, serving gourmet, seasonal delights in spectacular settings. Have lunch at Aragu which serves Michelin-star cuisine as you float above the ocean, or sip sublime cocktails with your feet in the water at the stunning poolside Avi. Head to the exclusive spa for a day of pampering or enjoy an array of watersports, such as diving, snorkeling, sailing or fishing, while your kids are taken care of the exclusive Kid’s Club. Practice your golf swing in paradise at the championship Golf Academy on the island. 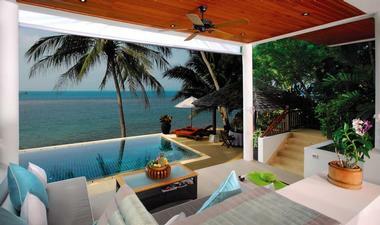 Villas start at $2,400 per night. If you want to be just steps from the ocean, ask for the Raffles Beachfront Villa Suite, a two-bedroom luxury suite just steps from a tropical beach. The villa suite has a private plunge pool and an outdoor sheltered pavilion with a day bed and dining table. There are several great dining options that serve a mix of local dishes and international cuisine. Losean Restaurant offers buffet breakfasts with a variety of flavors. Themed evenings are very fun and feature Mediterranean cuisine with local influences. If you have a craving for seafood, head to Curieuse Seafood Restaurant where you can dine on locally caught fish and lobster. For a light meal, there is the poolside cafe and bar and Takamaka Terrace, a rooftop lounge with spectacular ovean views. Guests can take Creole Cooking or cocktail classes which will allow to to bring a taste of the essence back home with you. Suites at the hotel start at 790 Euro per night. You may also like: 10 World's Most Romantic Private Islands and 25 Most Unreal Resort Pools. Shangri-La's Boracay Resort & Spa in the Philippines is located above the stunning Punta Bunga beach, offering a panoramic view of the sea. Travelers who like solitude, peace, luxury and flawless service should visit this beautiful resort. 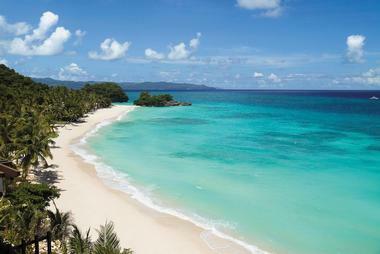 Boracay Island is the jewel of the Philippines, home to White Beach, one of the best beaches in the world. Choose from 219 villas, suites and guest rooms, featuring modern decor with classic local influences. Each room has a private balcony so that you can take in the fresh ocean air. The Seaview Suite with a private whirlpool and marble flooring is perfect for honeymooners who want to be close to the sand. Tree House Villa offers some of the best sunsets. The Presidential Villa is the most luxurious, with its own lap pool and outdoor gazebo. Pick from four restaurants: the poolside Cielo serves some of the finest cocktails and pizzas. Rima lets you enjoy an Italian dining experience in the Philippines. Hidden between the tree-tops, the setting is indeed romantic. Siren restaurant is located at the top of the cliff. This is the signature seafood eatery with a casual and carefree ambiance. Vintana restaurant offers great views of the ocean and serves delicious pastries. Alon bar serves tasty snacks and tropical drinks. If you want to spend some quiet time, then the Lobby Lounge is the place for you. Take in the gentle breeze as you sip a cup of tea. Hand-rolled premium cigars are available too. Solana serves a tapas-inspired menu and refreshing cocktails. Chi Spa is a sanctuary of peace and tranquility, offering hydrotherapy, stretching, body massage and many holistic treatments. Couples enjoy five star wedding services, letting you get married in style in a most beautiful setting. Rooms start at PHP 19,300/night (63 36 288 4988). The island of Koh Lanta, off the coast of Southern Thailand is known for its pristine ocean and secluded tropical beaches. Travelers enjoy awesome scuba diving and plenty of privacy. ou will be surrounded by a lush tropical rainforest on one side and open ocean views on another. The resort is set on 100 acres, offering its guests plenty of privacy. There are just 121 guest accommodations, many with fabulous views. One of the distinguishing features of the resort is the award winning spa built like a small village, featuring charming straw roofed Salas which blend with the surrounding jungle. Each treatment room was built using native wood, stone, bamboo and ceramics. Book your treatments before you arrive to make sure that you get all the services of your choice. In addition to diving, guests enjoy a wide selection of water sports and other activities free of charge, including canoes, windsurf board, sailing boat and boogie boards. There are no motorized water sports which contributes to the peaceful ambiance. If you are traveling with the whole family, kids can borrow beach toys, soccer balls, frisbees and other gear. The property is a great base for exploring the nearby Lanta Marine National Park which offers great snorkeling. Visit the Emerald cave with its long tunnel ending in a lagoon. Other fun activities include seasonal sunset cruises, Thai cooking lessons, biking, elephant trekking and other tours. Rates at the hotel start at 8,500 THB. The resort is about one hour by boat from the mainland. The hotel can arrange tours, shopping excursions, fishing trips, riding, helicopter and submarine trips. For evening entertainment, head to St Lawrence Gap, a few minutes away, which offers nightlife, dining and shopping. There are 161 suites with private patios or balconies, bath and shower, and cable television. Ask for one of the suites with a view of the ocean. Restaurants serve three meals daily, included in the daily rate; Chelonia and Asagio's have an elegant casual dress code after 6pm. Rates start at $502 per night, all-inclusive. The property is 20 minutes from Grantley Adams International Airport, and 15 minutes from the capital of Bridgetown. Always look for deals to save (001-246-428-7131). 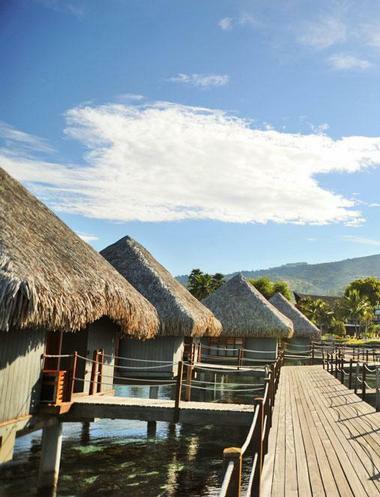 Le Meridien Tahiti is an ideal romantic island getaway because getting there doesn't require as many plane and boat rides as other resorts in French Polynesia. The resort offers in room massage services, a sandy bottom swimming pool, scuba diving, kayak rentals, and a discover dolphins program. Splurge on one of the overwater bungalows on your romantic getaway - you will be able to access the lagoon right from your room. 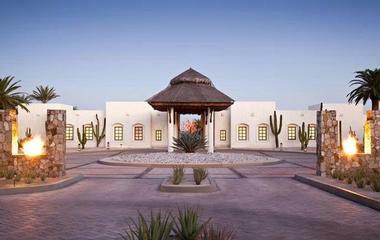 If you want to put together a fantasy marriage proposalbut don't know how, the director of romance at Las Ventanas al Paraiso, in Los Cabos Mexico, can help you with all the details. The combined skills of the resort's Executive Chef, the Spa Director and local vendors have led to many memorable romantic vacations and satisfied guests. If you think your vacation dreams are too complex, then guess again. To fulfill one romantic request, the Director of Romance found a white stallion so one guest could ride up to his beloved as a White Knight. 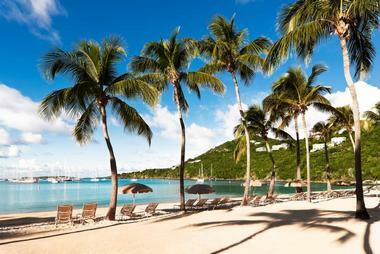 The Westin St. John Resort & Villas is a dream Caribbean honeymoon getaway with a sandy beach and a spa. The resort is set on 47 acres along the shores of Great Cruz Bay on the island of St. John, U.S. Virgin Islands. Stay in one of the stylish guest rooms or villas, many of which have scenic ocean views. Villas are a great idea for families who like the flexibility of having their own kitchen, washer and dryer and a separate sitting area. 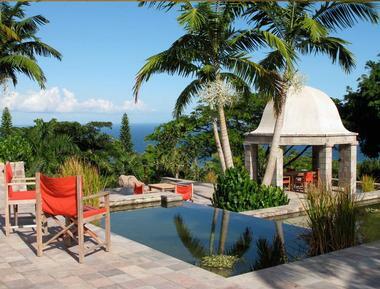 Villa guests also have access to a semi-private pool, providing you with more options for family fun in the Caribbean. The hotel offers a grocery delivery service to villa guests. If you let them know what you need four days before you arrive, your kitchen can be fully stocked with your favorite items. Explore the pristine Virgin Islands National Park while you are there. 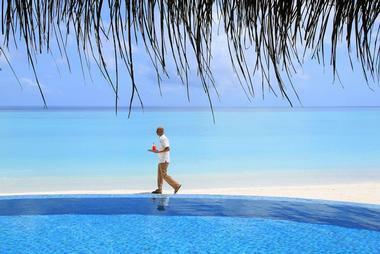 The hotel concierge can help you plan your tour of the island. Relax in the sun and try a variety of water sports, including snorkeling, sailing and kayaking. The spa offers an array of relaxing massages, facials and other rejuvenating treatments. Room rates start at $219 per night. 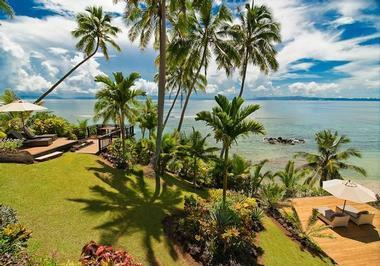 With just two private luxury houses and plenty of water-based activities, Taveuni Palms in Fiji, is an ideal honeymoon destinations. Taveuni, known as the garden island, offers a beautiful setting with its secluded white sandy beaches, lush tropical plants and waterfalls. You can even be the first person in the world to see the sun rise since the island is located in the path of the International Date Line. Each villas has a private pool, two bedrooms, fully equipped kitchen and two bathrooms. During your honeymoon, a personal maid will provide you with daily cleaning service, laundry service, fresh flowers and evening turn down. At night, sit outside on the deck and look up at the starlit sky. Scuba diving is spectacular on Taveuni Island in Fiji - there are two dive centers just minutes from the resort. You can also book a relaxing massage, go kayaking, explore secluded bays, hike to a waterfall, or simply lounge by the pool. Spend your days relaxing on the secluded Nonsuch Bay beach while watching dolphins and turtles swim by. 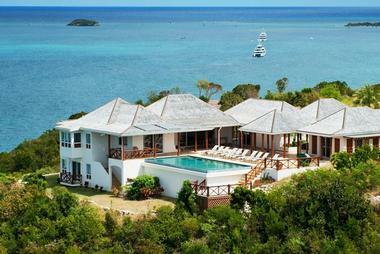 Located on the Caribbean island of Antigua, the resort offers stylish beach cottages, apartments and hilltop villas. Beach Cottages have two bedrooms, high ceilings, full kitchens and a covered veranda with beautiful views of the beach. Whether you want to relax with a book or enjoy breakfast with a view, the verandas offer the best of outdoor living. The cottages have 1,400 square feet of living space and are wonderful for families. Interior decor consists of contemporary furniture, hardwood floors and neat white walls. One of the bathrooms has a luxurious Jacuzzi tub. The best feature of the Beach Cottages is their proximity to the sandy tropical beach where you can go swimming and snorkeling. The resort's bar and restaurant are elevated on a buff to offer dramatic ocean views. Dining tables are set on a series of cascading terraces. The menu incorporates Caribbean dishes and international favorites coupled with award-winning wines. The resort offers ideal conditions for small boat sailing and kite surfing because the bay is quite protected and there are consistent warm trade winds. Rates start at $250. Packages are often available (+1 268-562-8000).